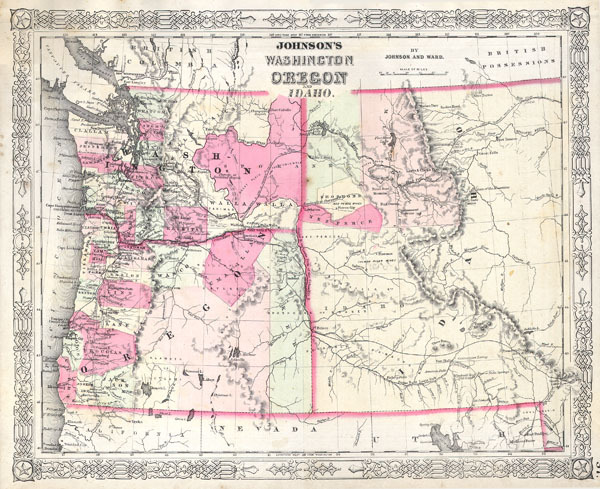 This magnificent 1864 hand colored map of Washington, Oregon, and Idaho is one of the most important transitional maps of the American Northwest published in the 19th century. Produced just prior to the exploration of Yellowstone National Park. What would eventually become Wyoming and Montana are included within the boundaries of Idaho. Also noted are numerous American Indian tribes, forts, passes, topographical details, proposed railroads, mines, etc.